May 23, 2017 in "Avatar Flight of Passage"
Pandora - The World of Avatar at Disney's Animal Kingdom is without question one of the most impressive landscapes ever built in a theme park. 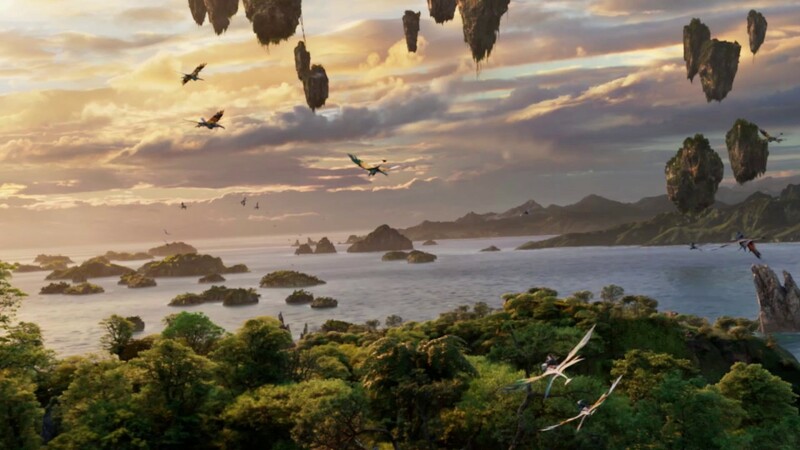 We knew when Disney recruited the legendary rock-work and environment specialist Zsolt Hormay back in 2012 that the look of Pandora would be something special. (See for yourself in our photo tour of Pandora at sunset). But every theme park fan knows that sometimes it can be a case of style over substance, so can Pandora - The World of Avatar deliver where it really counts - with its rides? The land features two attractions, the family friendly C-Ticket class attraction - Na’vi River Journey, and the headliner E-Ticket class Avatar Flight of Passage. If you’ve read our review of Na’vi River Journey, you know that although it was impressively detailed and features a breakthrough Audio-Animatronic figure, it left us wanting a little more. Step up Avatar Flight of Passage. Your Avatar Flight of Passage experience begins the moment you step into Pandora. The Valley of Mo’ara, with its extraordinary landscape complete with floating mountains, sets the scene and immerses you in a somehow familiar, yet alien world. Some question Avatar and its placement in Disney’s Animal Kingdom, and it has been argued amongst fans since the project’s announcement back in 2011. Disney has even made videos with head creative Joe Rohde leading the case for why it belongs. It is incredibly clear once you are standing in the land that it really is a perfect fit for Disney’s Animal Kingdom. No other theme park in the world has environments that can match Animal Kingdom, and Pandora, although alien, looks and feels so at home in Animal Kingdom. We believe the decision for Pandora to go into Animal Kingdom was the right one. Finding the entrance to Avatar Flight of Passage isn’t as straightforward as most attractions. Pandora, being on another planet, doesn’t follow typical conventions, and instead, the entrances to both attractions are extremely minimal. In fact, if it wasn’t for the FastPass+ and Standby wait time structures, you would really have no idea there was an attraction waiting for you. Like most major rides, Flight of Passage offers FastPass+, Standby, and Single Rider. Doing anything other than standby means missing some of the queue, so the usual advice is valid here. First time rider, do the standby line. You journey into Avatar Flight of Passage begins with an uphill trek through the landscape and rock work. The views from here are spectacular, with views of the floating mountains and totem gardens. Waterfalls, bridges, reinforced by great forced perspective add to the visual beauty. Leaving the outside gardens, an entrance into a cave-like structure takes you to the next phase of the queue - and so important in the summer, glorious air conditioning. Here, the great-winged banshees, or Ikran as the Na’vis call them, are honored in paintings on the cavern walls. As the queue progresses, there is ever increasing evidence of the presence of the Resource Development Administration (RDA). In the Avatar movie, RDA was responsible for the damaging unobtanium mining operations on Pandora. Although long gone, much of the RDA built facilities remain. And now the queue transitions from natural cave structures to man made facilities. The RDA built rooms are beautifully themed. Airlocks, rust, old electrical equipment - the areas are just packed with details. Part of the next sequence of queue space is a bioluminescent mining area. The roof is supported by braces, and there are signs from the mining days throughout. Here we are introduced to the Pandora Conservation Initiative (PCI), which signals an uptick in the fortunes of Pandora, and reinforces Animal Kingdom’s message of conservation. PCI has taken over the facility, and is working to reverse habitat destruction and to study the mountain banshees, which is of great importance to us as visitors to Pandora. Passing further through the mining areas, we reach the PCI labs. Once home to the RDA, the lab has been partially restored to allow PCI to conduct research into water purification, habitat restoration, and the wider Pandora ecosystem. There are some great special effects at work in this area of the queue, with much to see. All of the effects are physical, with no screens involved. They include water purification creatures, and a most impressive Avatar suspended in a tank. Leaving the lab, we enter the Banshee Tracking room. A large video screen shows the location of the mountain banshees in Pandora, along with their human and Avatar riders. Murals on the wall show the old and new - RDA Mining from the past, and PCI for the future. In this room, guests are divided into separate queues to enter the link chambers. The ultimate destination in this experience. Queues here are long straight corridors, taking on a very industrial basement-like feel. Guests are allocated a number, which corresponds to positions on the floor in later rooms - much like at Star Tours. At the end of the corridor, doors open to allow 16 guests at a time to enter the first pre-show area. The genetic matching room is where you are matched to your Avatar to take a flight aboard a banshee. Similar to the Test Track briefing room, the show here is mostly video based. Adding to the realism are several augmented-reality type moments, where guest movements are combined with parts of the video. The decontamination sequence is particularly good. There are a lot of special effects in the genetic matching and decontamination room, which makes the experience appear very realistic. Also explained in the preshow is how each guest will be matched to an Avatar, which look like the Na’vi, but are actually a blend of human and Na’vi DNA. Once you are matched with an Avatar, your mind will be able to control the matched Avatar from a special link chair. Your chosen Avatar will be able to ride on the banshee, but give you the complete experience of the flight. Banshee flights are impossible for humans, but the Na’vi and Avatars have developed a special connection with the banshee, and can safely fly them for what is an important right of passage for the Na’vi. The story design from the creators is a clever way of giving guests a banshee flight, but without the guest actually being seated atop a banshee, which would be almost impossible to recreate in a convincing way. The preshow also offers a background brief about the damage caused by RDA, and reinforces the park’s conservation message. There is also a nod to Jackie Ogden, who was Disney’s Vice President of Animals, Science and Environment for many years. Leaving the genetic matching and decontamination room, guests are grouped into the final briefing room. Here, the ride vehicle seating system is explained, and guests are issued with 3D glasses. After the briefing, it is on to the Link Chamber - the place where the ride will actually take place. The ride vehicles somewhat resemble motor cycles, and guests ride them in a similar way. Straddling the seat, with a leg either side, chest resting on a support, and hands on a rail either side. The vehicles are individual, but groups are seated together in the same room alongside each other. Once seated, in an Alien Encounter-like moment, various restraints move into position around your legs and back. At first they appear too constrictive, but then loosen up to give you some breathing space. We certainly wouldn’t call the seating position claustrophobic, but for anyone sensitive to being restrained in a slightly unusual position, it may be a concern. Also of note is how the ride system handles body shapes. We’ve had reports on the forums where guests have not been able to ride due body shape, and this is something Disney will address with a test vehicle outside of the attraction. Bags and personal items can be stored in racks behind the vehicles, with plenty of space and a dedicated spot for each rider. It is without doubt the best bag storage system on any ride. Each seat is equipped with an onboard video display, that relays various startup information, tracking maps and various data regarding your mind connection to the Avatar. All designed to give you something to focus on as other guests get situated in seats, and the cast can complete the loading process. Once everybody is ready, the ride begins. In a very convincing transition, the wall in front of you vanishes, and you are suddenly in flight aboard a banshee. You can even feel the banshee breathing beneath you on the link chair. To say the ride experience is convincing would be an under-statement. It is without question the best screen based attraction anywhere. The feeling of flight is so immersive, that you quickly forget you are in a simulator, and just begin to take in the sensational joy of flight. The 3D imagery is beautifully clear, and doesn't suffer from any distortions or artifacts. Staying true to the realistic nature of the experience, there are no cheap 3D tricks at play. Motion of the ride vehicle, wind, scents and water effects bring the experience to life physically. The creative team went beyond just the basics of flight, they even built crosswinds into the simulation model. There are obvious comparisons to be made to Soarin’. Both rides are screen based, and use a motion base physically suspended in front of the screen. Whereas Soarin’ is slow and graceful, Flight of Passage is fast and dynamic. Having ridden Flight of Passage, Soarin’ shows its age. Flight of Passage is superior in every way. The 3D imagery, the motion base range of motion, and its synchronization to the film makes Flight of Passage very much a next generation screen based ride. As you would except from the team behind Avatar, the visuals are spectacular. The huge screen size wraps around you, and envelops you in the world of Pandora. Avoid looking to the extremities of the screen, you can see the edge, and it does take you out of the experience for a second. On a first ride, you are likely to be so immersed in the physical and visual effects that you may not notice, but there is a wonderful musical score that accompanies the ride, recorded by the London Symphony Orchestra. Perhaps slightly surprising, is that like Na’vi River Journey, there is no mission or real story to the actual ride sequence. There is of course a larger story of the whole attraction and what you are doing there, but there isn’t the classic Disney “Something has gone wrong” storyline. There are a few tense encounters, and sudden drops, but overall, the ride is a flight experience of convincing physical and visual sensations. The ending to the 4.5 minute ride is abrupt, but even so, it leaves you very satisfied and with that all important feeling of a great ride - can’t wait to ride again! Leaving the link seats, the exit is a lengthy walk through the building via a series of industrial looking corridors. Like the main queue, the look is very convincing, and progresses from a basement feel to natural cave-like structures, reversing the entrance queue path. Guests finally emerge from a small cave and back to the visual beauty of the Valley of Mo’ara, where of course they can also visit the Windtraders gift shop for Avatar merchandise. Avatar Flight of Passage delivers a total experience greater than any of its individual parts. The queue is something to experience in itself. Almost like a salute to the best of Disney queues, it uses every trick in the book. There is a beautiful lush outdoor queue, like something out of Typhoon Lagoon; a natural cave like structure that rivals the best of Pirates of the Caribbean or Splash Mountain; an industrial area, that is as rich and detailed as the Tower of Terror basement, and even hints of the E.T. queue and old Back to the Future briefing rooms from Universal. Walking the queue almost feels like being in a first-person shooter game. So many different environments, and so well put together. The animatronic and the lab effects make for a great distraction to what will undoubtedly be a long wait. Why all the effort on the queue? It is designed to hold four hours worth of indoor queue. It needs to be good. The ride sequence is both family friendly and thrilling. It carries a 44” height requirement, and assuming that is met, anyone can ride Avatar Flight of Passage. Motion sickness does not appear to be an issue, with even those guests who are sensitive to motion sickness not reporting any issues with Flight of Passage. If they meet the height requirement, riding with kids would seem to only be an issue for young ones if they can be overly stimulated, or may struggle to understand what is happening and become frightened. And just incase you were wondering, it really doesn't matter if you haven't seen the Avatar movie. The land makes no assumptions, and has the depth to work at different levels of Avatar knowledge. For those who were skeptical about how good a screen based attraction can be, Avatar Flight of Passage may just change some minds. There obviously remains the need for physical sets and movement-based rides, but given Avatar has previously only existed in film, Disney has done an incredible job of bringing Avatar to life in such a convincing way.